Cool devices need power. They derive this power from batteries. Batteries drain quickly. You have to re-charge your batteries. Lather, Rinse, and Repeat. This elementary logic simply highlights the fact that we're slaves to our batteries, and so we must make quick work of keeping their insatiable thirsts for electric juice by charging them. And most of us (Us, meaning the tech geek, nerd, modern gamer, etc) have more than one device, so Griffin created the PowerDock 5. No, this is not the 5th generation of said device, but the 5 signals how many devices can charge from the station. The PowerDock 5 is, as the name suggests, a docking station that has 5 full-powered USB ports (read: 10 Watt Power through all 5 ports). 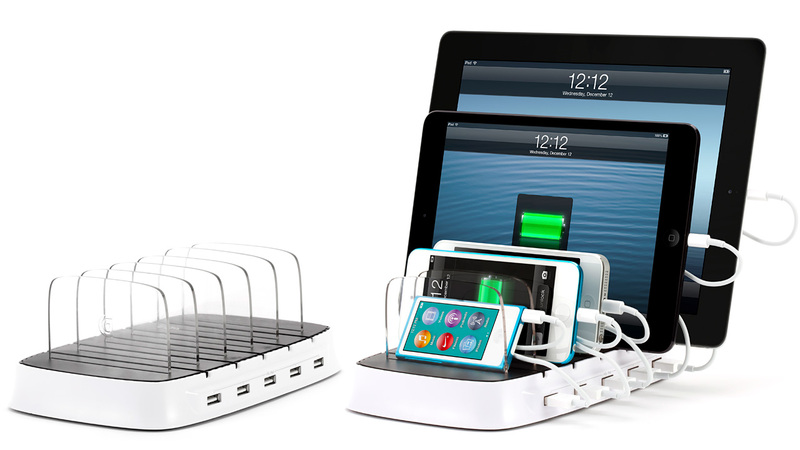 Like a surge protector for up to 5 USB chargers. Though the packaging may suggest this is only compatible with iPads or iPhones, quite the contrary, you can use any USB charger. I have my iPad, iPhone, Kindle, headset charger and PS Vita all connected. It should be noted, however, that some devices tested, don't necessarily work, according to Griffin. Workmanship on the device isn't bad, but the choice of plastics feel a little cheap. This doesn't take away from the overall usefulness of it, however. I'm also comparing it to the Griffin TWENTY Airplay Amp, that has that Apple-like plastic feeling. The only improvement I'd suggest would be a better cable management system. What ends up happening is you double cross the cables to help hide them, but they just get messy, and there's no clean, secure way of keeping it tidy. The images on their site suggest it to be much easier, but I just couldn't get them to stay clean and tidy. A small gripe for helping to manage your array of devices that need charging. Mashbuttons.com would definitely recommend the PowerDock 5 for your charging needs. The PowerDock 5 retails for $99, however they're currently out of stock on their online store, instead try Amazon.